The Bank of Thailand have unveiled (8th March) the new series of bank notes which will depict the country’s new King Rama X, who succeeded his father the late King Bhumibul Adulyadej (Rama IX), after a reign of 70 years — the longest reign within the Chakri dynasty and in Thai history. The new bank notes which are designated as series 17, were only finalised after the elaborate cremation ceremony of the late king in October 2017 — one year after his actual death. They depict the 65-year-old King Maha Vajiralongkorn (Rama X) who is dressed in the uniform of an air force commander in a three-quarter left-facing portrait which is placed towards the right half of the bank notes. 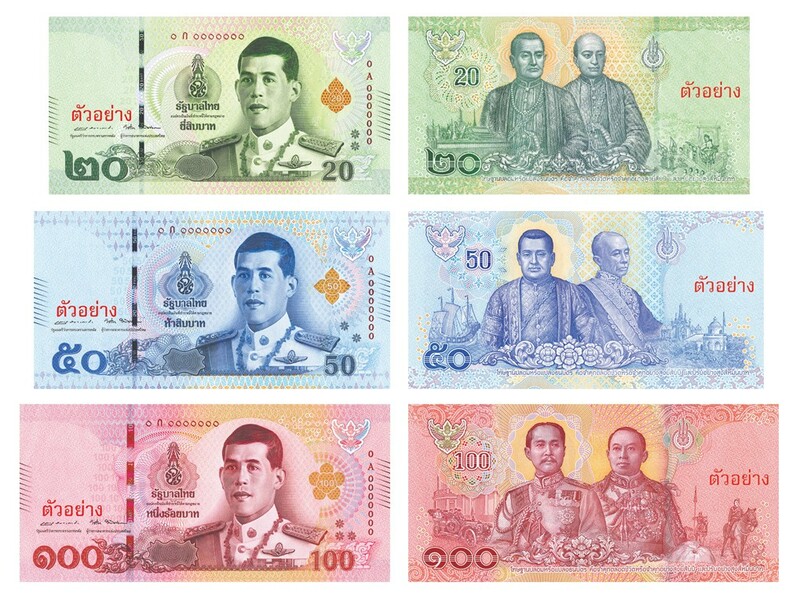 The colour designations for the currently circulating five denominations, 20 to 10000 baht of the current series, remains — as do the dimensions of the series 16 bank notes. The back side of all the notes have also undergone change as the five designs all carry images of all 10 Thai kings who were born into the Chakri dynasty. The Bank of Thailand have advised the public that three of the smallest denominations, the 20, 50, and 100-baht notes will be officially released into circulation from the 6th April, which is also the national celebration of the Chakri dynasty founding — as well as the 236th anniversary. The two remaining denominations of the 500 and 1,000-baht bank notes are presently under production and will be officially released on the 28th July, which is the 66th birthday of HM King Rama X. Green 20-baht: The back depicts the image of King Phra Phutthayotfa Chulalok (Rama I), who founded the Chakri dynasty as king of Siam on the 6th April 1782. The second image includes King Phra Phutthaloetla Naphalai (Rama II), who reigned from 1809 until his death. The note measures 72 x 138 millimeters. Blue 50-baht: The back depicts the image of King Nangklao (Rama III), who was succeeded by his younger brother, King Phra Bat Somdet Phra Poramenthra Maha Mongkut (Rama IV). Rama IV is internationally renowned as the king who was portrayed in the musical The King and I, which is the story of Missionary Anna Harriette Emma Leonowens years in the Court of Siam as a teacher of the king’s children. The note measures 72 x 144 millimeters. Red 100-baht: The back depicts the image of King Poraminthra Maha Chulalongkorn (Rama V). Chulalongkrn is remembered in Thailand as having saved the country from colonisation by British and French armies. The second image is that of King Phra Bat Somdet Phra Poramenthra Maha Vajiravudh (Rama VI). Aside from being the country’s head of state, King Rama VI is also remembered as one of Thailand’s highly renowned artists, as he wrote modern novels, short stories, newspaper articles, poems, plays, and journals. The note measures 72 x 150 millimeters. *Under production purple 500-baht: The back depicts the image of King Prajadhipok (Rama VII). He is remembered as the last absolute monarch and the first constitutional monarch of the country, as well as the only Thai king to abdicate. He was succeeded by his kinsman, Ananda Mahidol (Rama VIII). Nine-years-old at the time of his recognition as king of Thailand by the National Assembly, he was at school in Switzerland. Upon his return to Thailand to assume his duties as king, he was inexplicably found to have been shot dead under very mysterious circumstances. The note measures 72 x 156 millimeters. *Under production brown 1,000-baht: The back depicts his late Majesty Bhumibol Adulyadej (Rama IX). Born in Massachusetts, King Rama IX is Thailand’s only king born in the United States. He succeeded his older brother King Ananda and became the longest reigning king in Thai history, beloved by the whole nation and whose death was greatly mourned. The second image is that of HM King Maha Vagiralongkorn (Rama X), who is standing alongside the father he succeeded in 2016. The note measures 72 x 162 millimeters. The bank notes issued from 2012 to 2015 within the 16th series as well as bank notes issued in 2017, which were in commemoration of the late King Rama IX, are currently in circulation and will remain legal tender until otherwise directed by the Bank of Thailand. How come coins release date is still to be announced?